The Keurig B70 Platinum Single-Cup Home Brewing System is a coffee machine that is designed to make a single cup of coffee at a time. And this machine not only brews coffee, it makes tea and hot chocolate as well. The machine uses "K-cups" which are pre measured units of coffee tea and cocoa (they come in about 200 varieties so you can select the coffee bean that you like best), and all you have to do is fill the water jug , insert the K cup in the top of the machine, and select the size of the cup of coffee you want brewed - you get to choose from five cup sizes, 4 ounces (espresso cup), 6 ounces, 8 ounces (regular cup), 10 ounces (large mug) and 12 ounces (extra large mug). You can also get a custom filter K cup (the My K-Cup Reusable Coffee Filter), that you fill with the coffee grounds yourself, which is reasonably priced. The entire brewing process per cup should take four minutes, and you can program it to keep the water heated so that the next cup of coffee is brewed faster. The water jug is blue-lit, so you can see how much water is still in it (it holds up to ten cups), and is removable. It has a descale indicator to alert you when you need to descale it. 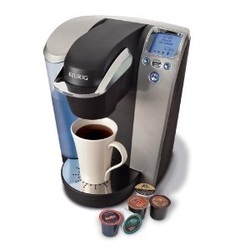 About Keurig: though their name implies they are German or Dutch, they are in fact an American company, based in Massachusets, with parent company Green Mountain Coffee Roasters. However, the word "keurig" is Dutch and means "excellence". Keurig have licenced their technology to both Cuisinart and Breville, who also make coffee makers using the "K-cup" technology - which means K cups that go into the Keurig B70 will also go into the Cuisinart SS-700 and Breville BKC700XL. The machines are almost identical (the K cup technology, the 5 cup sizes, the water filter, the programmable LCD display). They look different though, and customers have reported slightly different performance as a different manufacturer is involved. One major difference between the Keurig B70 coffee maker and Cuisinart SS-700 on one hand, and the Breville BKC700XL on the other hand, is that the Breville BKC700XL can make iced coffee as well.